I was recently invited to contribute a post to Suzanne’s Dear Reader Column and was happy to oblige. The brief was to write on whatever topic I chose. Mushrooms came to mind. I have some very old recipe books. Here’s a picture of the page that prompted my column. Stewed mushrooms in gravy was a dish my mother used to make. It looked so disgusting that I never tried it until this year. Some of the readers of Suzanne’s blog asked me for the recipe. Since it’s not easy to read from this photograph, here it is. Below that is a link to the blog. Materials – As many mushrooms as may be piled together on a vegetable dish, as they shrink in cooking; two ounces of butter; a quarter of a pint of milk; a little flower; pepper and salt; two tablespoonfuls of gravy. Process – Cut off the stalks and remove the thick skin on the outer part of the mushroom, and lay them in a stew- pan in the stock or gravy, and the butter. In about ten minutes’ time add the milk and pepper and salt to taste and allow the mushrooms to simmer until perfectly tender. Dredge slightly with flour to thicken the sauce, and serve in a vegetable dish. 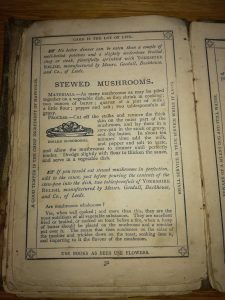 IF you would eat stewed mushrooms in perfection, add to the sauce, just before pouring the contents of the stew-pan into the dish, two tablespoonfuls of YORKSHIRE RELISH, manufactured by Messrs. Gooddall,Backhouse, and Co. of Leeds. Yes, when well cooked; and more than this they are the most nutritious of all vegetable substances.They are excellent fried or broiled, or cooked on toast before a fire, when a lump of butter should be placed on the mushroom and a tumbler put over it. The steam that rises condenses on the sides of the tumbler and trickles down on the toast, soaking into it, and imparting to it the flavour of the mushrooms. Thank you to Suzanne for asking me to contribute to her blog. Here is the link.